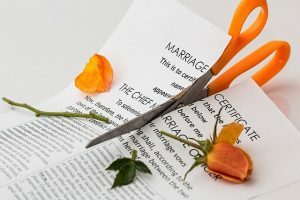 Divorce: What happens to your ownership in your business? Divorce: Who Buys, Who Sells? Last week’s post was about the importance of having a buy-sell agreement in place so that the business can transition smoothly in the event of the death or disability of one of the owners. At the beginning of that post, I mentioned that we are currently dealing with a situation that would be much less fraught if the owners had the foresight – or the proper advice – when setting their business up; a couple that started and grew a successful business but are now divorcing. So, what happens when the owners are married get a divorce? It happens. It’s best to be prepared. The couple is now “enjoying life” in the fallout of an acrimonious divorce. One wants to sell its 50% share but the other refuses to buy (at anything even remotely representative of value) or to permit the sale of the first partner’s 50% to a third party. Let’s explore what should have been done. When setting up a business with a partner, you must consider all the possibilities that life could throw at either or both of you. Nobody wants to think about the three Ds – divorce, disability and death. The last will happen to all of us, the first will happen to half of us and some unfortunate portion of us will become partially or fully disabled. How is the business impacted by these events other than that the remaining partners have to figure out how to perform the work that was previously done by the now-missing partner? As Owen Van Syckle discussed in our post last Monday, one of the many reasons for a buy-sell agreement is that, in the event of the death or disability of one of the partners, the remaining owners will have a method to purchase the deceased or disabled owner’s share from that owner’s estate – and the insurance to fund such purchase. Absent that ability, the estate becomes your partner in the business, a situation that could result in various children, cousins, siblings, etc. of the deceased showing up at your office asking to meet their new partner – you – and for checking-signing ability. But that is only one of many reasons to have a buy-sell agreement between or among the owners. The situation we’re currently dealing with is illustrative of the need for such an agreement in the event the partners are or include a married couple. The difference between this situation and that of the death or disability of a partner is that an insurance policy is not needed for the divorcing couple. The couple, married for umpteen years, began to disagree on the operation or direction of the business. Perhaps one had a roving eye and this contributed to the rise of what became a very difficult workplace environment. Each owned exactly 50% of the business which, without an appropriate operating agreement to address such things, completely eliminated the possibility of solving decision stalemates about pretty much anything – from the hours of operation to when each of the partners would be able to take time off. The result is where we are right now. One wants to be bought out – but at a price that is significantly above value; the other will buy out the first but only at a price that is significantly below value. The one that wants out has found a third party to buy their half but the remaining partner understandably does not want an unknown person to suddenly own 50% of the business. And this remaining partner will make such a transaction nearly impossible anyway, simply by being uncooperative. To take matters to the extreme, the remaining partner now says that it will now longer consider selling even at the price it proposed a year ago – at least three times the business’ value! They’re stuck. The partner that wants out has few options, none of them pleasant or likely to achieve the desired goal. They can continue to work in the business – essentially with the intent of being a “stone in the shoe” of their partner in the hope that, at some point, they will wear their partner down to a level closely resembling reasonableness. If this has even a remote chance of working it will also result in a constantly deteriorating work environment, a loss of competent employees, rumors in the community that are guaranteed to impact the business’ reputation and, ultimately, some level of damage to the business – making it worth even less than either of them want. Another option is to sue the intransigent partner to force a buy out, a strategy that could very well be successful but at some cost – initially, legal fees but also appraisal fees. But the big cost would be that the true value of the business would be the basis of the court’s judgement. That is, the “loser” would have to buy – or allow a third party to buy – the exiting partner’s 50% but at the current value of the business; significantly more than was offered and significantly less than was asked. There are two ways to avoid this, one crummy, the other brilliant. Neither are available for our clients now because it’s too late. But if you’re setting up a company or currently operating one in an environment of partnership bliss, give these some thought: The first way is with proper organizational documents, one of which includes a buy-sell agreement (the “Brilliant” way) and the second is with almost proper organizational documents one of which includes a mandatory arbitration clause (the “Crummy” way). Let’s look at the Brilliant one. A buy-sell agreement can be pretty simple. It states that one party has the ability to dispose of its share in a specific manner or manners. Generally speaking, the first manner is to offer the shares to the other partner(s) at a stated price. “BUT”, you say, “that’s exactly what the exiting (“offering”) partner did!” True, but the limited scope of that statement does not force anybody to consider value. Without some specific additional language, the offering partner might say “I want $1 million for my half of a $1 million business.” It won’t work that way. Nobody with a three-digit IQ will pay $1 million for 50% of anything worth $1 million. But by adding a modest condition to this buy-out provision, we have a sure way of providing a method for one partner to exit and, at the same time, establish a price both parties see as fair – even if neither walks away happy. The buy-sell agreement should be structured similar to this: the offering partner offers his or her shares to the remaining partner(s) at a certain price and the remaining partner has the option of accepting that offer or selling ITs shares to the offering partner at the same price, a decision the offering partner is compelled to accept. If the offering partner knows that they might be forced to buy their partner’s shares, the offering partner will establish an offering price that it believes is closely related to value and at which they would be willing to pay for the 50% they don’t own. This is incredibly important to understand: the offering partner would have to offer his or her shares to the other partner at a price that the offering partner would be willing to pay for the other partner’s shares. There’s a lot more to it than that – time frames, payment schedules, notes, what to do if one party wants out but neither party wants to buy the other out, what to do in the event of default and the sequence of these events among other issues – but the concept is simple and pretty much guarantees a price (value) that both parties can accept if not rejoice over. Good legal advice is important when establishing a business, especially when there is more than one owner – and when your established business is taking on a partner. And an attorney that specializes in business startups and small business law is important. Don’t hire a divorce attorney, an elder law attorney or your cousin the ambulance chaser. Get a specialist. If you’d like a recommendation, let me know in the comments box, below. If you’d like a list of organizational documents – corporate resolutions, LLC membership agreements, operating agreements, offering memoranda, etc. let me know in the Comments box at the bottom of this post. We’ll be posting more on this topic, so don’t forget to subscribe so you don’t miss any of these very important organizational components. It might save you significant aggravation – and money – someday. If you have any questions or comments, put them in the Comments box. I’ll get back to you with answers or my own comments. If I get enough on one topic, I’ll address them in a future post or podcast.